I tried to fix the issue, but there is probably an issue with how our backend code pulls the .json file for the 3D rendering. 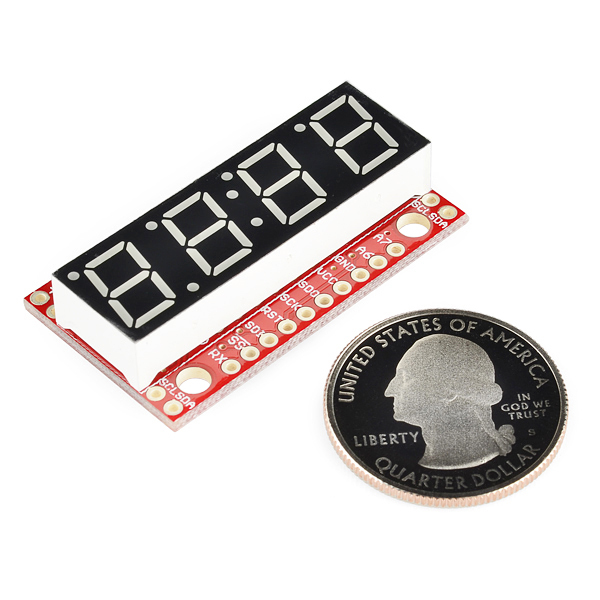 You can use the 3D model from this product page: https://www.sparkfun.com/products/11629. Otherwise, our software team will look into the issue when they can. We made a neat case for this display, which you can download and 3d print. Why has the following never been corrected in the instruction data for these ? Old and new PDFs have it.
" [0x01][0x02][0x0A][0x0B] (Actual binary values 1, 2, 10 and 11) "
Why don't the pics have the ruler scale included in the picture like they used to? I've noticed this on various products in the past few months, means you need to spend time digging into the data sheets rather than quickly glancing whether it's what you want or not. What's worse is that it's not just one person doing this. Everyone who comes here must waste time doing the same thing! We pay the SparkFun price because we believe they offer a better service. A HUGE part of that service is the info they provide on the internet. As I'm seeing the quality go down, I'm starting to feel less and less comfortable with the prices. Here is a great example. https://www.sparkfun.com/products/7950 Read the comments. Is it mislabeled or not? No one even knows what the heck this product truly is. SparkFun is COMPLETELY SILENT on the issue. I'll look into getting dimmensions posted. As for the Piezo speaker we sell thousands a month with very few complaints. Unfortunately while we try to keep an eye on the comments we do miss some. If you ever have a question of a problem please email techsupport@sparkfun.com directly and they will get back to you. Looks like they just changed the default DISPLAY_TYPE to S7S in the git repo and tweaked the net names in comments to line up better. Another tip, I needed to reset the EEPROM to defaults after the first time it was reprogrammed to the latest. I just downloaded the firmware and it is NOT set to S7S. It is still set to OPENSEGMENT. Note for others: If you try and load an S7S with this setting wrong, you will get an AVR Dude error. is there still anything i am missing in this? Have you changed define DISPLAY_TYPE OPENSEGMENT to define DISPLAY_TYPE S7S in Serial_7_Segment_Display_Firmware.ino? Are you using the Arduino IDE and selecting the board Serial 7-Segment Display after putting Serial7Seg in the Arduino hardware folder? hi could some one help me i want to know can i program the display using arduino uno as a ftdi ??? Is anyone else having an issue when sending the display the same set of data over UART at 9600 baud rate? I have it cycling through a list of set messages, and it works. But sometimes it will leave a digit blank and wrap the digit that should have been there to the next message in the list. Is this a common glitch? What can I do to fix this? I was running two of these displays off of an arduino powered by a 12V battery.When I checked back on it after a while both displays went dark and I cannon get them to power on again. I am wondering how I managed to fry them. I was powering them from the arduino's 5v port. Can this ever fluctuate beyond the max 5.5 volts when the arduino is powered from a battery? I am trying to bring these boards back to life but to no avail. 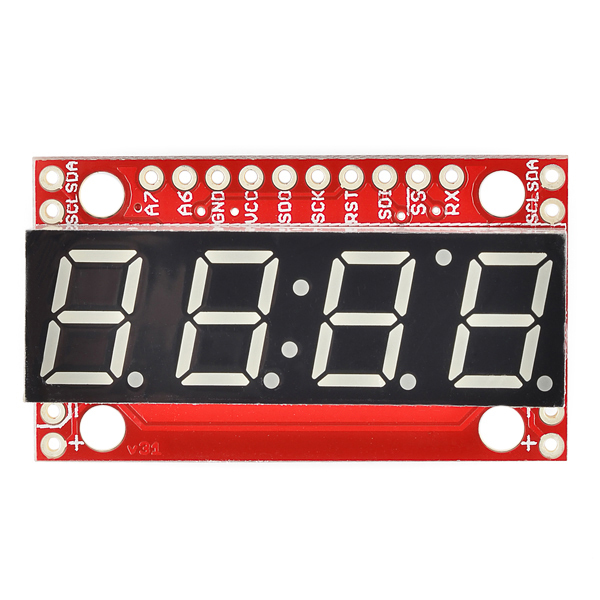 Hi, Does anyone know what the maximum clock speed/frequency is for the I2C SCL line of the Serial Display? And do I understand correct the board does not have pull up resistors? Am I correct in understanding that all this board needs is a FTDI connector and you can program it directly from your PC with the code examples? I want to establish for sure that there is no need for an adruino board since an at-mega chip is built on board and that there is no other items needed other than power and a on/off switch once it is programed. The board was designed for people to connect to their microcontroller and display values sent to it. Because of the number of pins needed to control the display its often not possible to add it to a project without an extra microcontroller anyway. But like you said, there is a microcontroller on board so you can reprogram it to do whatever you want using an FTDI board. There seems to be a (minor) bug in the firmware of the device: Sending the brightness command 0x78 with the parameter 117 (0x76) or 118 (0x77) results in ressetting the display - I suspect that the device interprets these two parameters as a special command. Hi! After downloading and updating the firmware from "define DISPLAY_TYPE OPENSEGMENT into:define DISPLAY_TYPE S7S" I still have the same problem. I canât get the display to properly show the data with decimals. I have a temperature string from a DHT11 with this format: 23.20 and all I can get to display is 23 Can anyone help? Iâm sure itâs something simple in the code but... Thanks! The only way to print decimals is by sending the Decimal control command. If you wanted to print "23.20", you'd have to send 2320. Then, to print the second decimal, you'd need to send a byte value of 0x77 (decimal command) followed by 0x02 (turns the second decimal on). Anyone have any information about troubleshooting the FTDI connection? I keep getting a not-in-sync response (avrdude: stk500_getsync(): not in sync: resp=0x00) and I don't know what to do. The datasheet says that FTDI can power the display and reprogram it, but it seems like that might not be the case. are you selecting the correct board in the IDE? whatever you're using, try a different one. Ok guys, I have read as much as I can find in the docs on github and doing some searching on this module but I am not seeing/understanding how to get letters/strings of letters to display in I2C mode. I see a couple of examples that reference serial mode. Do I have to change everything to serial mode to display letters? I don't understand what happened. I was working great. displaying numbers just fine. Now all of a sudden all I can display are letters and single digits. I used to be able to use serial.print now that only works for "v" and "xxxx". I have tried resetting it to the factory defaults. Baud is good. Anybody have this experience? Is it possible to use one of these to control another of the same displays I2C? 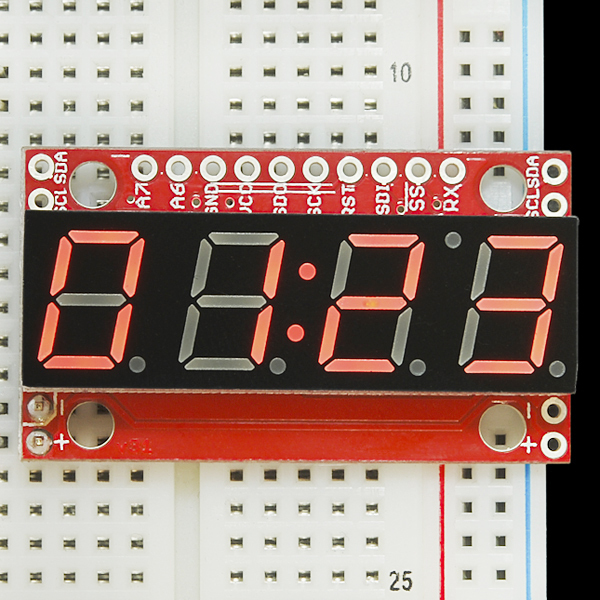 I'd like to make a 12 digit display, wondering if I need a separate ATMEGA/Arduino. Any simple example of using float? I created a library to easily print floating point numbers with these displays last year: https://github.com/joshvillbrandt/Serial7. I Try to rebuilt this circuit on a braedboard with a ATMega328P in DIP Package. I use the Board 7SegDisplay, but the Circuit dont work after Uplaod without Crystal. But i need this two Pins any idea? I got 2 of these and connected them through I2C to an Arduino. I changed the I2C address of one of the displays (0x70). It all worked just fine but after a while the display with the changed address changed back to the original address (0x71). I can change it back to 0x70, but after a while it sits on 0x71 again, really annoying. Does anyone know why this happens? Is it possible to connect two (or more) of these to a single ardunio on the same serial line (just connect it in parallel) and have them display the same information. Yes, use the I2C connection. If the displays have the same address, they'll show the same information. I used this for a clock/thermometer running from a PI 3. The serial TTL was very easy to interface. Adjustable brightness was useful. I would have liked a slightly larger display but that was not available. A previous comment indicated dim output. With a 5 V Arduino Uno this was very bright. I actually cut back a little on the brightness by setting it at about 75% through the software. I found the documentation pretty good. I had to get more information, but that was because I'm not very good at serial protocol. I think this is a good product and will be ordering a couple more for some other projects. Thanks. Handy sized and bright colour. Many different ways to control. On-board atmega is handy too. As an exhibit designer/fabricator, I use these things quite often. They're flexible (I usually use either SPI or I2C) and robust. 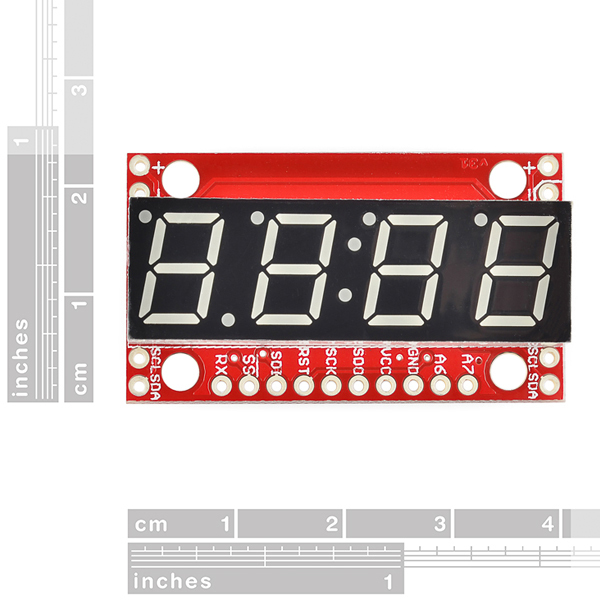 Together with the big-brother version (COM-11644) they are very useful anyplace we need digital timers/displays. 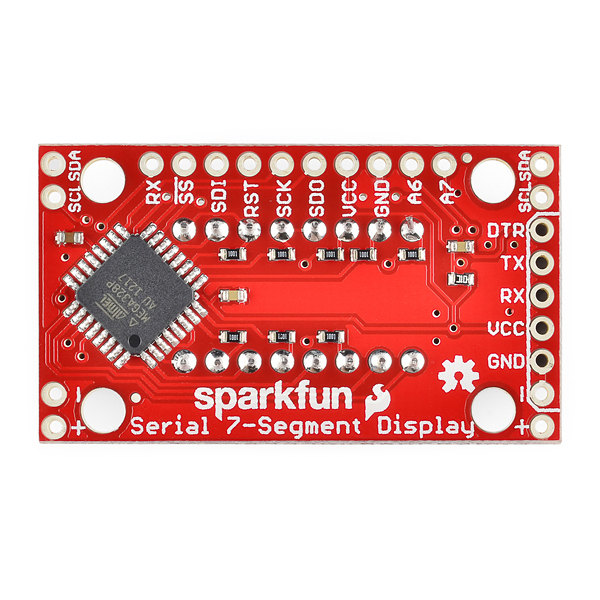 These 7segment serial displays are truly a game changer! I have good control with I2C with this right now. But be warned is a bit sensitive to static and noise. Since I decided to write a clock in VB6 for testing this, constantly updating the display (every 100 ms move decimal point, and every half second flash colon) when I moved with with my hand it apparently got garbled. Since I was using an Ardvark interface, and had the pull up's on it turned on, maybe I should have had resistors on the end near the board instead. But what happened is somehow it read it as a change I2C address. So I wrote a change to my vb program and found it had changed to address 181, which I found interesting. None the less a fun and very inexpensive display to work with. Also wish intensity control 0 would be totally off and not have to blank the display if you want it all not be be seen. But this is a personal preference. And most likely I could rewrite the software to do this myself. The nice thing about this is the excellent documentation. I may use these chips for replacement where I would normally use a MAX1447/MAX1496/MAX1498 as a volt meter display or a MAX7219 display controller in some things I build. Will be working with some A/D and use the source code and have a bit more fun with this chip and software. Only suggestion would be to add pad's to SCL SDA to add resistors to board if its on the end of a chain. This worked perfectly for my project. I only wish there was a bezel for it with a lens to make my project look a little nicer. Greetings. These displays can take anywhere from 3.0V to 5.5V and will increase in brightness with increased voltage(up to 5.5v). The resistors are current limiting resistors designed to protect the segments and as a result will make segments dimmer but increase the lifespan of each segment. Bypassing these resistors or removing them and adding a solder bridge can cause the segments to fail sooner. If you believe that you may have received a defective product please contact Techsupport@SparkFun.com. Used two I2C controlled displays. So easy to use thank to the Wire library. The only drawback: a weird letter "P", looking as an inverted "g", easy to correct by code.